Open Farm is a family business founded in 2013 that is based out of Toronto, Ontario, Canada. Their mission is to create pet food with high-quality, nutritious ingredients while keeping the welfare of the farm animals in mind. They produce grain-free pet food using a limited set of proteins, and fruits/vegetables that are raised naturally, responsibly, and humanely. Open Farm sources every ingredient from suppliers that they trust, and their goal is to create premium pet food while creating positive change in the industry with respect to farm animal welfare and sustainability. We were recently sent a package from Open Farm to try out, and we decided to do a quick review here. 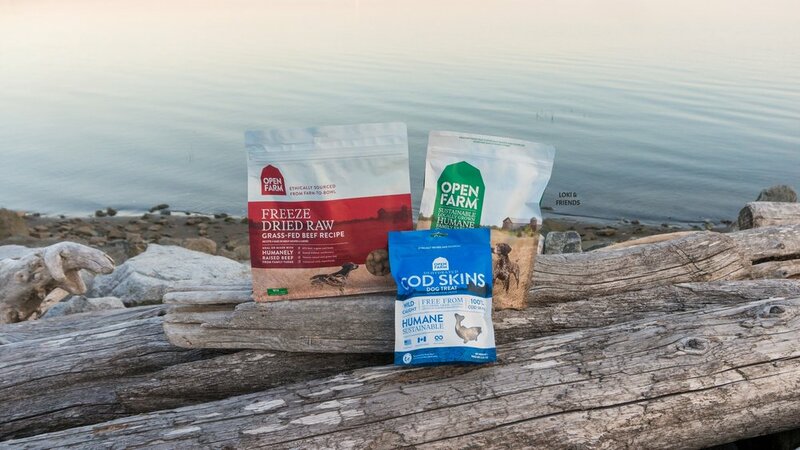 Open Farm’s dehydrated dog treats are made with 100% humanely raised meats. The meat is dehydrated at low temperatures to ensure the nutrients and flavours are preserved. They have 5 different kinds of dehydrated dogs treats available - Turkey, Chicken, Beef, Pork, and Cod Skins (they all retail for $11.99 on their company website). 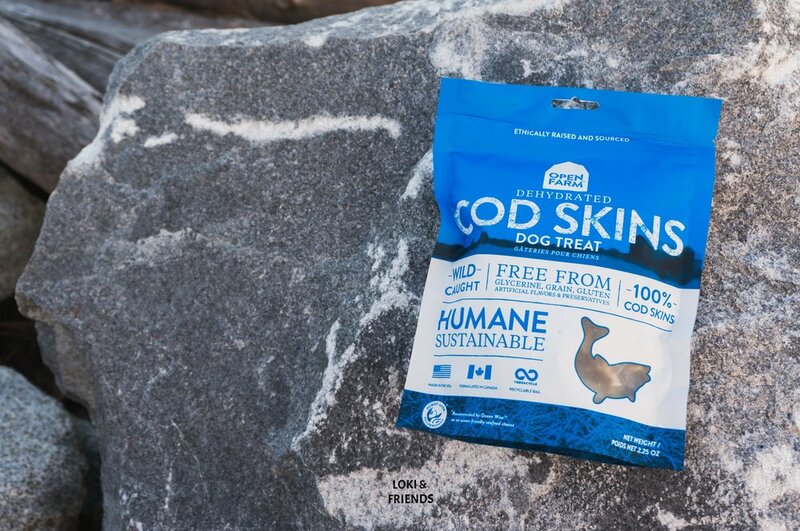 We received the Dehydrated Cod Skins recipe, which is great because neither dogs have tried cod before. The boys absolutely love these treats! We love treats that are made up of only one or two ingredients, and so do the dogs! The treats actually do not smell super fishy and gross, so they're perfect for those who dislike the fishy smell. The treats are super crunchy and easy to break apart into smaller pieces, so we used them while practising recall at the park. The boys, especially Bear, rates the treats as a high value snack, so our recall sessions went great when these were used! The second item that we received was a freeze dried raw recipe. 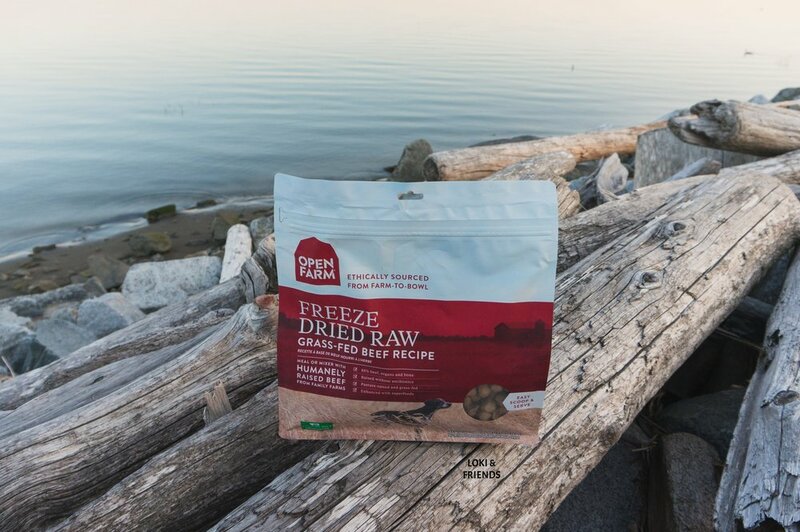 Every blend of Open Farm’s freeze dried food is topped off with superfood ingredients such as coconut oil and turmeric. All you have to do to prepare this food is to scoop the right amount, add water to it, and that’s it! On their website, there are a total of 6 different recipes available - Grass-fed Beef (the one we received), Homestead Turkey, Surf & Turf, Harvest Chicken, Table Pork, and Pasture-raised Lamb. All of them (with the exception of the lamb recipe which is $42.99) retails for $38.99 on their website. All of the recipes are grain-free. The bag is fairly pricey for the amount of food given, especially if someone has a large dog like Bear, but the ingredients used in this freeze dried food is of high quality. Because Bear weighs 70lbs and he would go through this bag super quickly, we decided to use the freeze dried as a meal topper instead of as a standalone meal. We use 1/2 cup of freeze dried food, crumble it up, and then add some water to it before mixing it in their regular kibble. Both dogs get super excited for their meals now, and they both lick their bowls clean. Yay for no food wasted! The third product that was included in our package is the Open Farm Homestead Turkey & Chicken recipe. 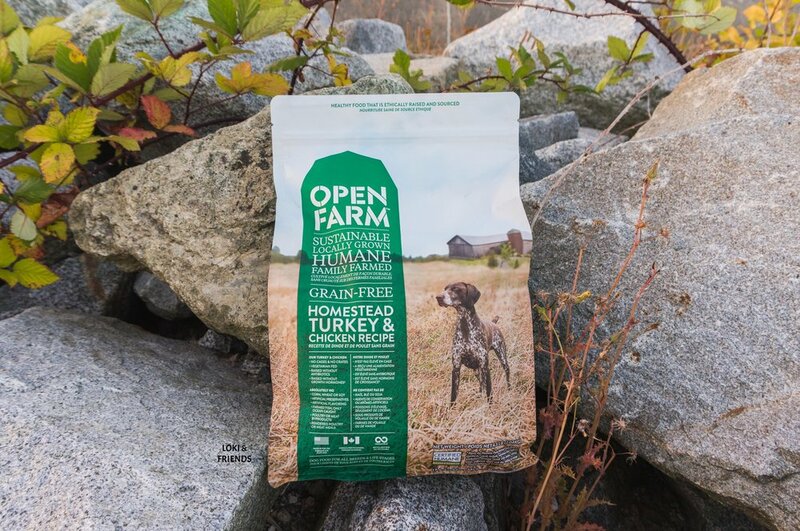 The Open Farm dry dog food comes in a variety of flavours - Homestead Turkey & Chicken, Catch-of-the-Season Whitefish & Green Lentil, Farmer’s Table Pork & Root Vegetable, Pasture Raised Lamb, and Wild-Caught Salmon Recipe. The dry dog food prices varies from $27.99-$29.99 for the 4.5 lb bags. All of the recipes are grain-free. Bear eats anything and he loves this recipe. Momo, on the other hand, is a bit of a picky eater, and for the most part he enjoys this kibble. We find adding some Open Farm freeze dried dog food to his food makes his meal time go a bit smoother! We like how we can alternate between all the recipes in the Open Farm dry food line without upsetting the dogs' tummies, which is great for pups like Momo who gets tired/bored of their kibbles within a few weeks. The ingredients used in the dry food is great - we love that we can actually understand every single ingredient on the list. In conclusion, both Bear and Momo enjoy the Open Farm products that we received in the mail. Bear loves the Dehydrated Cod Skins the best, and Momo’s favourite item has got to be the Freeze-dried beef that we use as their meal topper. We love that the food is made of high quality ingredients, and that consumers are able to purchase dog food made of ingredients that are ethically raised/sourced and locally grown. Thanks again to Open Farm for these samples! Disclaimer: We were sent these samples by Open Farm to try out. We were not paid nor asked to do this blog review.